While believing God will hear and act, we need additional categories of prayer. he ancient Israelites were formed by their songs to recognize God as the One who hears their prayers, supplications, and cries, and were exhorted to put this recognition to the test through prayer. In the New Testament, the disciples never ask whether God hears. Such a belief is already entrenched in their mind-set. However, they do ask Jesus how to pray. The Gospels portray Jesus both as a person who prays often and extensively, and as a teacher who criticizes the prayers of Pharisees as hypocritical and ineffectual. Jesus is, therefore, both model and critic, and His disciples want to pray in ways that conform to Him and also keep them from falling under His critique. While we have heard it said, “Everyone knows how to pray, so just do it,” we can follow the disciples’ example and seek instruction. This was brought home to me in March 2008 at the Society for Pentecostal Studies conference. The presidential address by David Daniels was on the “Sounds of Pentecost,” wherein he argued that Pentecostal services were distinctive not only because of the theology preached, but because of the sounds heard during the meetings. Such prayer to the God who hears brought a smile to my face. Then a tear came to my eye, so to speak, as I asked myself, Why did this recording “take me back” rather than remind me of “now”? I have spent the last few years reflecting on that presentation and my response to that recording. I certainly would not advocate a return to something just because of nostalgia, nor would I assume that such “roaring” was a sign of a time when the church was more attuned to God than now. Perhaps that Pentecostal forbearer believed similarly to the Israelite psalmists before him—namely, that confessing God hears entails a belief that God acts, too. The two are sides of the same coin. I suspect this is the import of Elijah’s scorn of the prophets of Baal on Mount Carmel: the inaction of Baal means Baal is a deity that cannot hear, and therefore is no god at all. Understanding God as the hearing-acting God, however, can lead to an exhausting prayer life and a frustrated life of discipleship, the quality of both determined by the success one has at getting God to adopt one’s action plan. If prayer to the God who hears and acts always seems like making a case for action, then there is hardly any relationship to God beyond that of lawyer to judge or middle-management to the CEO. Our time and energy is used up trying to hone a good argument—that God is simply the supplier of needs, and prayer gets reduced to petition and intercession. The solution to this challenge, I believe, is not capitulating to the doctrine of divine sovereignty, where we simply wait for God’s will to transpire—as if it were some abstract plan disconnected from our personal histories of desire, trouble, mis- sion, and active cooperation. Rather, while believing God will hear and act, we need additional categories of prayer. at Lee University. How could we four pray every morning without it becoming inanely repetitious? The second was during a “Theology of Prayer” graduate class I taught at Lee. In that class, we read books, essays, devotionals, and treatises on prayer that spanned 1,800 years. Out of these two experiences, a liturgy of prayer developed that forms the structure of my own prayers and that of those students I still pray with every morning. This liturgy of prayer follows a precise pattern of prayer-forms (confession, adoration, lament, thanksgiving, petition and intercession, and benediction with blessing). puts us in our proper position before God; that is, a fallible creature before the infallibly holy Creator. However, we only begin here because to tarry in confession too long would necessarily bring despondency. opens us beyond our insufficiencies to the super-abundance of divine love and gives us the opportunity to declare to God and to one another God’s greatness. , whereby we express gratitude for what God has already done and is doing. , which involves requesting God to do new things and meet new needs. The benediction recapitulates the themes of the prayer session. It also pronounces God’s blessings for the day and requests that we might leave the place of prayer under the power and with the presence of the Holy Spirit. What would make this pattern a Pentecostal liturgy of prayer? 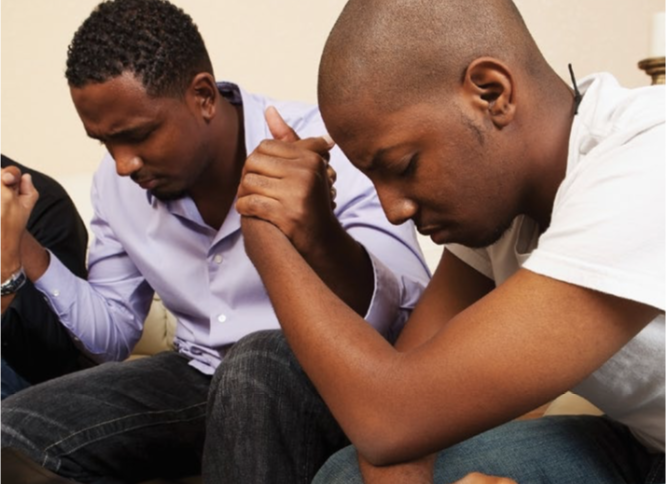 While one prayer partner offers the respective prayer form, the others are invited to quietly and simultaneously pray in the Spirit. The incorporation of various prayer-forms during prayer sessions enables Pentecostals to strive with God while also recognizing His action toward us in ways that are not reduced to meeting petitions. The God who hears, then, is the God . . .
• who speaks to us and through us while praying in the Spirit.